Three years ago, Reading Hospital in West Reading, Pa., embarked on a $354 million expansion project that would add 476,000 square feet to the 147-year-old hospital. The goal was to replace and relocate operating rooms spread across four buildings and provide 150 new private patient rooms. Today, Seventh Street Tower, as the new nine-story addition is called, welcomes patients and visitors to a facility that features privacy, flexibility and the latest technology available to healthcare professionals and their patients. Running throughout most of the facility — including five floors of private patient rooms, 24 surgical suites with six hybrid operating rooms, eight minor procedure rooms, reception, recovery areas and an expanded trauma space — is Noraplan eco with Nora nTx. Nora nTx is a pre-applied, solvent-free adhesive backing that minimizes prep work and eliminates drying protocols, saving valuable time and money. LF Driscoll Co. estimated a total time save of approximately two months using Nora products. The product is also resistant to high moisture vapor emissions and extensive pH limits, which eliminates the need for moisture testing and remediation before installation. This again significantly decreased installation time. 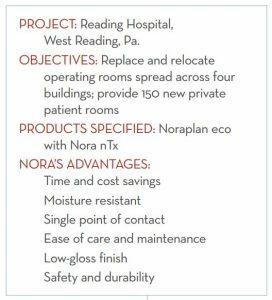 From a maintenance perspective, Noraplan eco with Nora nTx does not require waxing, making care and patient throughput — ability to move patients throughout the hospital — and turnover faster and nearly seamless. Nora product was not only specified for its life-cycle attributes, ease of maintenance and time/cost savings, however. Aesthetics and safety played a part in the decision as well. 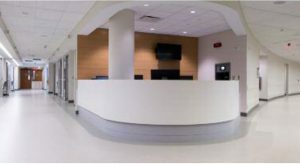 Noraplan eco with Nora nTx features a low-gloss finish, which has been found beneficial in healthcare as glossy floor coverings can disorient patients. Further bolstering wellness, Marie Keim, director of epidemiology infection control and prevention at Reading Health System, noted the importance of flooring when it comes to safety She praised Noraplan eco with Nora nTx for its solid, dense, smooth qualities that give the hospital an extra barrier against residual water or bacteria, its ability to resist stains and its comfort underfoot for patients and staff. 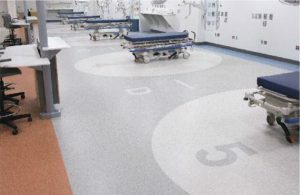 For more information and to watch a brief video about the use of rubber flooring in the hospital, visit the Nora website. 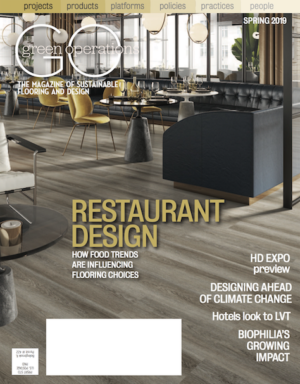 “Noraplan eco with Nora nTx offered two important advantages from a construction standpoint. The floor significantly reduced installation time, and we had one company providing all of the warranty for the flooring which is pretty much unheard of on other projects. Getting one warranty from one supplier on the project was very helpful.” – Jeff Hutwelker, project executive, LF Driscoll Co.